Who was Eva Braun? Was she a naive, passive victim who happened to simply fall in love with an older, charismatic man known as Adolf Hitler? Or was she, as some have alluded to, a shrewd partner who played an active role in one of the most massive genocides in history? How much did she share the Fuhrer’s antiSemitic beliefs and/or his plan of exterminating millions to accomplish the goal of “purifying” Europe? In Eva Braun: Life with Hitler, author and German historian Heike B. Görtemaker systematically and methodically paints a portrait of Eva Braun as a woman who is multifaceted and complex. Her analysis is based on statements and observations from people in Hitler’s inner circle as well as documented details (including photos) delineated in chronological sequence both prior to and after the war. The research in this biography is impeccable, including over 40 pages of notes in the post-text and an extensive bibliography that would impress even the most discriminating reader. Shrouded under the veil of secrecy for most of her adult life, Eva Braun remains somewhat of an enigma. Hitler’s public declaration was that “Germany would be his only bride.” In private though, a secret relationship between the two continued to grow despite his public image of being solely dedicated to the state. Eva met Adolf Hitler in 1929 when she was 17 years old and he was 40. As Ms. Görtemaker states in her conclusion from her research “Nothing could stop the attraction that apparently sprang up spontaneously on both sides” from the instant they met. Eva Braun and Adolf Hitler solidified this enduring relationship toward the end of their lives by getting married. Apparently Eva Braun achieved her ultimate goal—marriage to the Fuehrer—which finally legitimized her importance to him while also assuring her place in history. There are conflicting descriptions of Eva Braun from Hitler’s closest allies. Her relationship with the power players within the Nazi regime differ depending on who in the entourage is asked. Of course after the war, Nazi officers were more invested in saving their own lives and may have purposefully distanced themselves from any close relationship with her. Convenient memory losses were common among the Nazi elite. There is little in the way of public documents that would fully explain Eva Braun and her motives as most of her papers, photos, and films she created remain in the National Archives in Washington. There are no letters to her from Hitler or vice versa that we know of. Hitler was very leery about any personal correspondence for fear that anything in writing could somehow be used against him. However, Ms. Görtemaker’s documentation of other sources intricately put the pieces together that form the puzzle of Eve Braun’s life. There are clues to the young Eva’s relationship with Hitler and an educated assessment that portrays Eva’s life as a young woman. Some such clues are in various writings from people such as Albert Speer (one of Hitler’s most trusted colleagues) who described himself as well as Ms. Braun as an “addict, dependent and possessed from without.” He further explained that “they were both equally prisoners of their emotions, even enslaved. She was like me, under Hitler’s so to speak hypnotic spell and unable to break free of him.” There is no evidence that Ms. Braun was politically motivated, nor a member of the Nazi party. In an interview before his death, Albert Speer stated that Ms. Braun had been “helpful to many people behind the scenes” which was not known to anyone outside the inner circle of power. Eva Braun: Life with Hitler is both an engaging and hypnotic read for those who enjoy history as well as biographies. 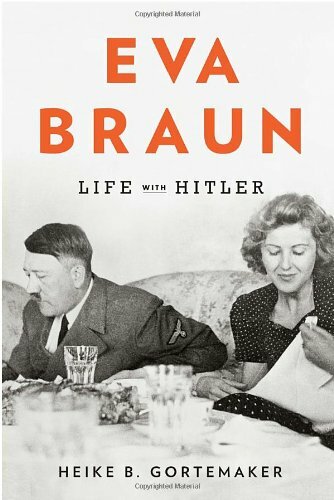 Though some of Ms. Braun’s deepest thoughts are still somewhat an enigma, the book both enlightens and crystallizes much of what made her tick. Though she spent much of her life with one of the most controversial and despised men in history, it is clear that Eva Braun was willing to sacrifice her life completely for him. Whatever one might think of their relationship, it is certainly worth the time to read about and ponder the complexities and mindsets of these individuals.